Leveraging on our huge industry understanding and knowledge, we are providing Blow Moulding Services. These provided services are delivered by well-trained professionals as per set industry guidelines. Due to its perfection and promptness, this service is broadly valued by our clients. Blow molding ( BrE moulding ) is a manufacturing process by which hollow plastic parts are formed: It is also used for forming glass bottles. ... The parison is a tube-like piece of plastic with a hole in one end through which compressed air can pass. Blow Moulding Services produces hollow three-dimensional articles from many of the thermoplastics materials which are available as granules or powders. The simplest tool consists of two female parts which contain a cavity when closed. We are one of the best organizations in the market, involved in offering a wide collection of Blow moulder to the customers at reasonable rates. In line to meet utmost satisfaction of the clients, this Blow Mould are best in working. 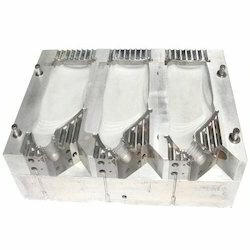 High quality metal is used for the obtainment of these blow moulds. Durable in nature, these moulds are heat proof and completely safe from the damage by rough condition. These moulds are durable in nature and remain sustained for several years. We are highly instrumental in providing Water Bottle Blow Moulding Service for our valued customers. We are offering these services with the help of highly talented professionals. Offered services are also checked on various quality parameters. These services can be availed from us within committed time period as per the need and demands of our clients. We Have Full Equipped Machinery For Production Of Blow Moulding Components. Capacity For Blow Moulding Components Is Upto 1 Litre. Pharma bottle, chemical bottle, fridge bottle, jar etc available in multi colour, job work also done as per requirement. To cater the variegated needs of our esteemed customers, we are highly engaged in offering a wide array of Plastic Bottle Casting Mould Die. Steam lines are blown prior to starting up a new unit to remove any debris, sand, oil, rust etc. that may be remaining in the equipments prior to plant start-up. Our steam blowing systems are backed by best quality engineering and quality equipment. To provide excellent standards in Service and Quality, RPC is equipped with some of the most efficient and advanced machines for Injection Moulding. At RPC production is done on microprocessor controlled fully automated injection-moulding machines. Using top-of-the-line Latest Injection Moulding machines' enables RPC to produce high quality components consistently. Plastic injection molding is the primary process for manufacturing plastic parts. Plastic is known to be a very versatile and economical material that is used in many applications. Although the tooling is expensive, the cost per part is very low. Complex geometries are possible and limited only to mold manufacturability.